These are our new fenders. 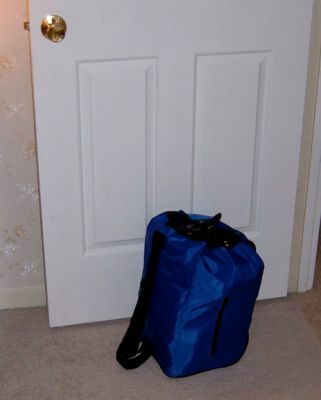 Four are in this bag along with a foot-pump with which to inflate them. These are really cool. Look at the size of this bag. 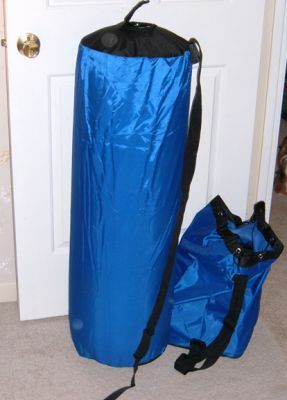 Four fenders were stored in this bag, along with the pump. They inflate in a minute and deflate in less than a minute. The size in this photo is the extra large but they come in all sizes. You would think a 56' boat would have room for fenders! The problem is the larger the boat, larger fenders are needed. Boat Bunkers has solved this problem with these inflatable fenders. The fender has a strap with quick release to make it easy to hang from your rail and a D-ring on the other end. The outside cover zips off for easy cleaning. These are great! Note: The first fenders we have listed were a great idea but were not able to handle the pressure of a 60,000 lb. yacht. 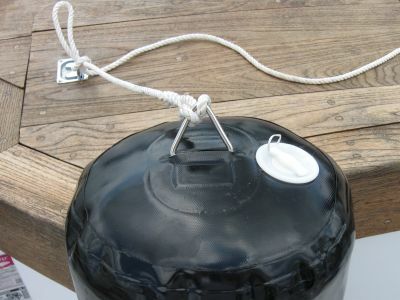 The thread was not heavy enough and the fasteners not strong enough for this vessel. NOW: Same principal but done to a much more robust scale. 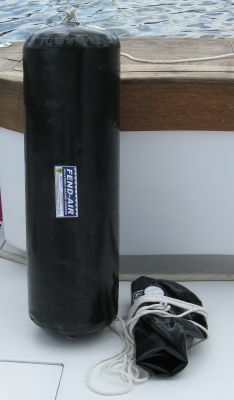 These fenders from FEND-AIR are made by the same people that make inflatable aperatus to raise sunken ships. They are strong yet inflate and deflate quickly and easily. From usable to stowable in seconds. A stainless triangle is attatched at top and bottom with reinforcement everywhere. We are so impressed that we are becoming distributors of FEND-AIR. We tested them. These are 12"x36" and we are getting a second set that are 16"x48". There is no excuse not to have big enough fenders any longer.